For some reason, last week I got it in my head that Allen Mountain would be my next Adirondack High Peak to climb. I guess perhaps it was partly because Leesa was away and she had told me that she wasn't anxious to hike Allen. Another reason was that the weather forecast looked iffy. I thought it would be better to stay below treeline if it was going to rain. So many people have said Allen was one of their least favorite high peaks hikes, so I wasn't expecting much. [I was in for a pleasant surprise]. I thought I would just make this trek and if it rained, it rained. I knew it was an 18 mile round trip hike. It was raining Friday night when I went to sleep, but it was supposed to clear for the morning. Later on Saturday there was a 50% chance for scattered showers to come back in. I decided that I would set my alarm and if it wasn't raining, I would get up and get to the trail head at 5 AM to get the hike mostly completed before any rain came in. I also had to be at Albany Airport at 4:30 PM to pick Leesa up. Well the rain stopped early in the overnight, so off I went. I parked on the road from Tahawus to Upper Works at the Mount Adams trail head. I was the only car there... no surprise at 5 AM! I had brought my water shoes to wear when crossing the failed Hudson River suspension bridge, the failing Lake Jimmy floating bridge and the non-existent Opalescent River bridge. None of the 3 water crossings were more than knee deep on this day, and the water wasn't unbearably cold. It actually felt good on the way out. After I crossed the Opalescent River, I left my water shoes behind and picked them up on the way out. The first water crossing was the Hudson River. This was the deepest, at about knee deep. The 2nd crossing was the Lake Jimmy floating bridge (which isn't floating so good after Hurricane Irene). It is partially sunk (and sinks more as you walk on it). I grabbed a walking stick from the shore to help with balance as I crossed and I made it OK. The "floating" bridge on Lake Jimmy has issues. Just beyond the fire observer's cabin (which is slowly being restored) the trail to Mt. Adams branches off to the left. Mount Adams is a short hike, but very steep. Minutes later, I came across a deer on the trail. He was quite unfazed by me and he let me get quite close. Eventually he hopped to the side and let me walk past. About 5:30 AM, the sun began to burn off some of the fog. The grass and trees were quite wet since it had rained during the night. Being the 1st person on a herd path the morning after a rain meant that I got soaked walking through the narrow trail and the wet grasses. By 7 AM I was totally soaked. I after 3.8 miles, and one hour of fast paced walking, I reached the Opalescent River crossing where it was less than knee deep on this day. After 2 hours of hiking, I reached another trail register. The trail had just crossed a final logging road and began working cross-slope in a southeasterly direction toward Allen Mountain. I this section, there are a few ups and downs, and generally a slight downhill with some very muddy sections. At the end of the cross slope traverse, the herd path reaches Skylight Brook and some very pretty water slides and cascades. Shortly after crossing Skylight Brook, the trail picks up Allen Brook at about 2300' and follows it up a steep ascent to Allen Mountain. Allen Brook is quite beautiful, but the herd path goes right up the brook bed in many areas and the sloping water slides are quite slippery. Hope on the trees and branches as you climb! I took one good mudslide spill on the way down. The herd path goes up the brook. Slippery in spots. Hold on to something! It had taken me 2.5 hours to get to Allen Brook. It took another 1.75 hours to climb the final 2000' up Allen Brook to the summit. I reached the summit at 9:15 AM. Not bad, 4 hours and 15 minutes to the top! The summit is wooded, but in 2 locations within 100 feet of the summit are great views. I was amazed. Sorry I have included so many photos on this trip report, but I wanted to let people know that Allen is quite nice (in my opinion). I had seen no-one on the way up, and after spending 30 minutes alone on the summit, I began my descent. About halfway down, I ran into a couple hiking up. Several minutes later, I came across 2 guys hiking up. One was a 46'er, and the other was doing Allen as his 45th peak. I should have asked him what his final remaining peak was. After I talked with those 2 guys, I didn't see anyone else. I was back at the car at 2 PM. A successful hike, plus I was able to get to Albany Airport by 4:30 and not make Leesa wait for me. Allen is a long hike, but not a huge amount of vertical feet and the views are rewarding. I really enjoyed this hike. As a bonus, it never did rain and the sun was out most of the day. No bugs on the way in. A few black flies at the top and a couple deer flies on the way out, but not bad for this time of year. The climb up Allen Brook is tricky, but if you hold onto things as you climb, you won't have to worry. I'm glad I'm not the only one who thinks Allen is a great hike! Those views of Skylight and Marcy are great, it's a perspective you really don't get from anywhere else in the High Peaks. I agree. I was impressed by the view. I thought the hike was interesting as well. I was the 45er you passed, on the way down. I found your blog while looking up distance and elevation gain for the Allen hike. Great summary and photos! Haystack is my final 4000'er. That sounds like a great one to finish on. I thought about finishing there as well, but now I decided to do Haystack, Basin and Saddleback tomorrow. I may finish with Iroquois. I was very pleased to come upon your post! Allen will be number 37 for three of us, and the plan is to have that happen on 18 Aug 2012. Good Luck. I enjoyed Allen. It's a long day, but I didn't find it to be a slog. The terrain was varied and interesting and I had no problem following the herd path. 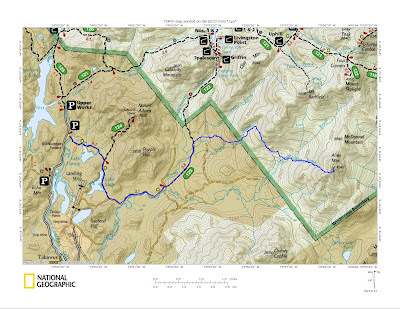 Could you mountain bike in the first few miles to the trailhead? I was there today. Much agreed, a great hike that gets a lot of undeserved bad press. After looking at your summer pictures, I see myself doing it again in the warm months. I should have gone with you yesterday for the winter version. I still need Allen and I think I missed a golden opportunity to cross the frozen rivers. I want to ski the flat sections. It should be great. Great blog you have. I plan to park at Upper Works and backpack to the Flowed Lands to set up camp on a Friday. From there I'll hike Mount Marshall and return to camp. 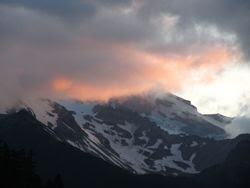 The next day, I plan to pack up camp and hike south on the trail (Opalescent?) to climb Allen Mt. I would like to set up my new camp at the point where the herd path starts east towards Allen. Question: Where would that heard path start off this main trail (red disk)? Thanks much, Reese. I haven't yet hiked the trail from Flowed Lands past Hanging Spear Falls to the Allen herd path. I've heard that it is not a trail that is used that often, but I plan to check it out this summer. At the junction of the trail with the Allen herd path, there is a sign pointing towards Allen. Thank you much. I'll just keep a sharp eye out for the sign that points to Allen. 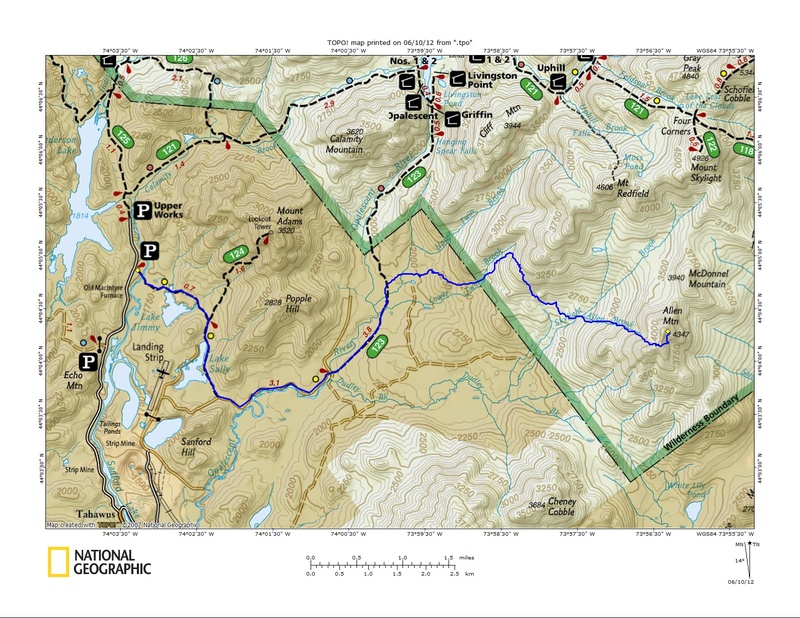 I wish my Adks High Peaks map showed the path towards Allen off the Opalescent trail. Great account of your trip. Very helpful so thank you for sharing. Looking forward to doing it as my 32nd. We are nervous about finding the trailhead, does it have signs saying parking for Mt. Adams or something? There is a big parking lot on the the right just before you get to Upper Works. This is the parking lot for Mt. Adams and for Allen Mountain. There are signs there at the trail register at the back of the parking lot. The biggest worry for Allen is the water crossings and the suspension bridge over the Hudson River near the start of the trail has been replaced. Lake Jimmy is now bypassed. The Opalescent River is only a challenge after a period of heavy rain. In drier times, it is less than knee deep. I was very glad to find your description of the hike. Allen will be my 46th peak and my brother's 35th. your pictures and blog are really helpful. After reading other accounts I was kind of dreading it. We just finished Seymour last week and are going back for the DSE group. in a week or two. We are planning an August finish. The water crossings had us worried but it sounds like it will be completely possible. Thanks. Thanks for reading and for the comment. Good luck! Did allen the other day, super fun and challenging hike! Found this guide helpful except that picture that says skylight brook is mislabled, it's actually lower twin brook. I honestly don't recall at this point. I thought I recalled it being close to Allen Brook, in which case it would be Skylight Brook, but I could be mistaken. How deep was the water on the Opalescent? I'm planning on going on 10/30/15. I haven't been there recently, but as of a few days ago, I heard it was calf deep. That sounds doable! Thank you for responding and thank you for making all of this information available. I tried to hike Allen and I think I only made it about 2 thirds of the way. I was able to make it to the herd path at the second trail register and from there I hiked in a little while with a brook below me to the right. Eventually I came to a fork and there were no rock cairns to be seen. I hiked on the path to the right for a little while until I saw a posted sign one the side of the trail. I wasn’t sure if I was going in the right direction so I decided to head back to my car without exploring the other path. Can you tell me if I was going in the right direction? I don't recall seeing a fork after passing the 2nd register. It sounds like you made a wrong turn to the right. I can't say for sure. Do you recall seeing posted signs? Very helpful description and beautiful photos. One of my best hikes, and I had dreaded it due to others' reports! Thanks. This report is a little dated now, but yes, Allen is not so bad, and in winter it is even more fun! Thanks for reading.